Discussion in 'Transformers Collection Showcase' started by Orodruin, Jan 31, 2005. So a few weeks ago I finally finished building my new shelving. I moved my cramped figures to new shelves that are much more spacious (54" wide up from 36", depth up from 12-15" to at least 18"). The wooden shelves are medium density fiberboard, with a 1x2 running under each edge. Total build time was about 7 hours (though I think I took an Adult Swim break in the middle) and total cost of the shelving was only about $40. I also have some shots of my non-TF shelf, which is home to my Iron Men, my Big O figures, and a lone Batman Beyond figure. I haven't uploaded the shots of some of the shelves yet, but I'll get to it sometime. Still waiting are: Armada Decepticons (mostly seekers), Universe and other random Decepticons, RID Armada and Universe Autobots, the Black repaint/e-hobby shelf, and the PVC/WST shelf. You'll be the first set in our new Collection Showcase Forum. Yay! Joins in on the dance. That's quite a setup you have there. Everything is so orderly. Nice job! How long did it take to get that far? Really nice setup! I love all the G1s! How long did it take to get that far? I've been adding to the 30 or so from my childhood since, oh, 2001 I guess. Most of it is from last year though. Better paying job + increase in addiction level. I just added shots of the collection from about a year ago, when I had only 100 bots. Hell of an increase in a year. Of course a lot of that is due to buying non-G1 lines. Killer collection man. Looks like Energon takes up more space than others. They always seem kind of crammed in displays. I got most of my stuff in single boxes, except for Energon, which takes 3. Dig all the cool G1's. I got to get me one of those Ehobby Sunstorms & Hauler. Have i seen this on another board? That is before i found this one hehe! That is a really nice collection. I wish I had that many Transformers. General update: I combined my season 3 bots onto one shelf and split the Energon Decepticons up so they have more room. I'm planning to do some re-shooting today or tomorrow, so stay tuned. Nope, this is the only TF board I post on. Though I did drop a link on Digital Metal once. Dont forget to re-shoot some of that Big O stuff as well because that's quite a little collection you have going there. Got ya covered buddy. Here's a shot of the Big O collection featuring the newly aquired Big Duo figure set. The rest of the shoot should be edited and online tomorrow morning sometime. Ok guys, it's all done! Everything has been uploaded, linked, sorted, etc. I added a new page with all the random extra stuff, including my black/e-hobby shelf and my PVCs (which is now my most crowded shelf by far!). I also split up the Energon decepticons so they look much better now. Enjoy! Gather round all, I did a total re-shoot yesterday! 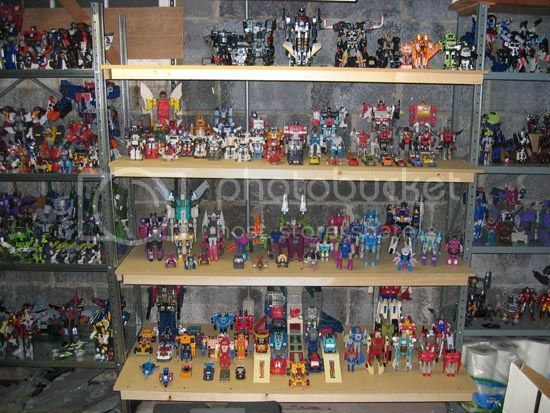 All the G1 shelves have been newly arranged (where needed) and fresh pictures are online. Also uploaded new shots of all the other shelves, with the exception of the WST/PVC shelf, alternators, and Cybertron shelves (cause I'm just too lazy right now). Enjoy!